The French expression esprit de corps is used to convey a sense of unity where an organization seeks a common interest and purpose. Companies in the 21st century need to build workplaces that not only inspire creative thinking and professional curiosity, but also invite their employees to engage fully in the enterprise. But, how can this be accomplished? The link between employees who work closely in a team and a happy and productive working environment has long been recognized. Team-building activities have therefore been designed to improve communication, to boost morale and to enable staff to get to know each other better. At CapeRay we have recently recruited three new engineers – James Long, Ameen Jakoet and Josh Perry – and, as a small team, we identified the need for a team-building exercise. 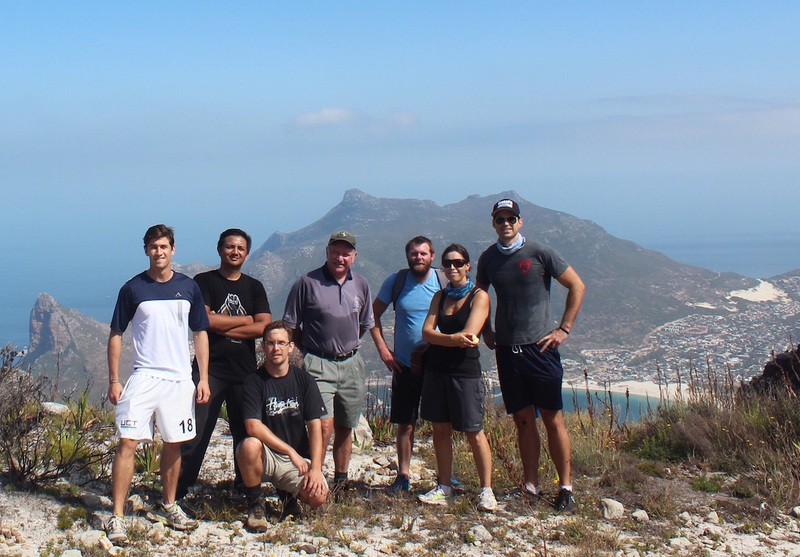 Josh suggested a hike, more specifically a hike up to the Elephant’s Eye, a large cave that overlooks CapeRay’s offices and is located on the south-east corner of the Constantiaberg mountain range (see above right). Yesterday morning at 9:00 am, equipped with water bottles, sunscreen, binoculars and smart phones, we set out from the dam wall in the Silvermine Nature Reserve. Over the next three hours we followed a circular route, covering a distance of more than 11 km and climbing the equivalent of 100 floors. 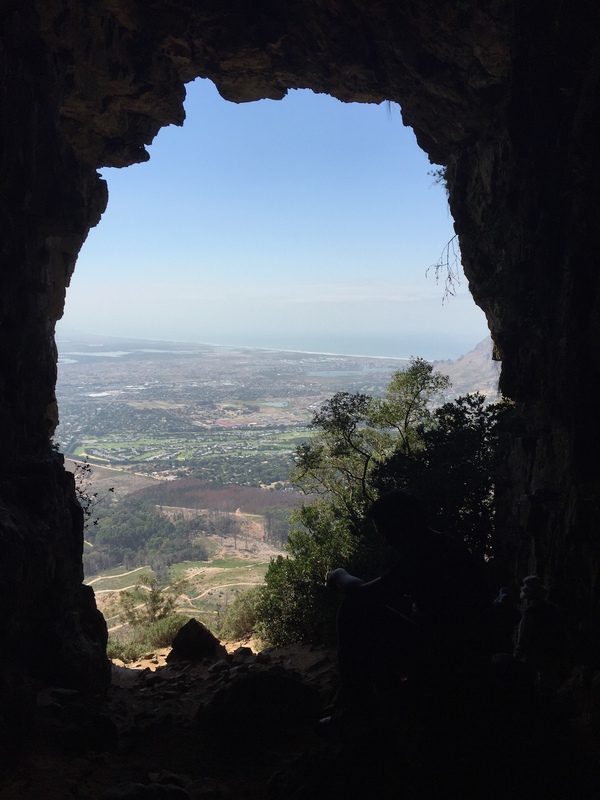 There were spectacular views of the Noordhoek valley and beach, the Hout Bay harbour (see team photo at left), and finally we climbed inside the Elephant’s Eye. From this final vantage point (below right), we could spy our offices at the southern reaches of the Constantia valley, with Muizenberg and the confluence of the Atlantic and Indian Oceans beyond. During the hike we shared personal stories and anecdotes, opening up to one another in a way that would probably have been difficult back at the office. There were opportunities for fun activities – Ameen released a large spider that his wife had caught at home earlier in the day – and more serious discussions, such as the feasibility of using hydrogen fuel cells in motor cars. The morning was rounded off with a swim in the dam and a hearty lunch at the Green Beans café in our business park. The next six months will be crucial for CapeRay as we prepare our Aceso dual-modality system for the CE Mark while focusing on commercialization. 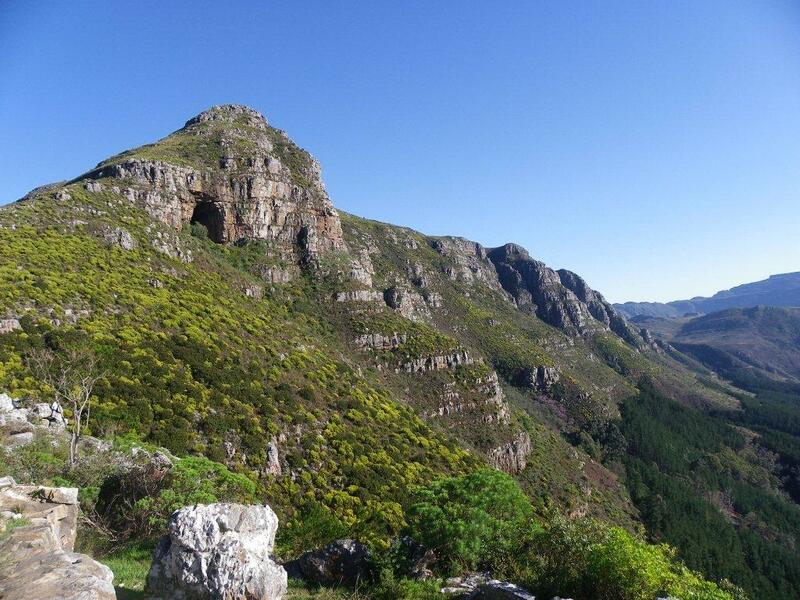 Our hike up to Elephant’s Eye will undoubtedly stand us in good stead as we take the company to the next level. Well done! Looking at your shirt, I can see it was a “fun” day – experiences like this glue people together; many times one underestimates the power of social interaction in a workplace. Best of luck for the year ahead – remember, Lodox’s door is always open for CapeRay, shout should you need any assistance. Many thanks for this feedback. You’re right about it being a “fun” day — the sweat on my shirt was a bit of a give-away! Hopefully it won’t be too long before we try something new to help the team’s focus.